The main advantage of the Super Pro range is its suspended vault. A metal frame is necessary to suspend the part in the center. Thanks to this installation method, ovens can be made in very large sizes and in a variety of shapes . 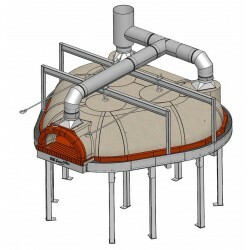 Ovens are proposed with a vault made of refractory concrete (Chamotte) and only on request with a vault made of Bricks. The floor is paved with 33X33X6 cm bricks. Technical data is available : Tab "download"